Starting a Commercial Truck Wash? Westmatic Truck Wash from Westmatic on Vimeo. offers a variety of large vehicle wash systems which will help you maintain a clean fleet image. What kind of truck wash equipment should I buy? Our Heavy Duty Three Brush Rollover is ideal for truck fleet washing and for commercial truck wash operations. The Heavy Duty can wash in a brush mode, a touchless mode, or a combination of both. Westmatic's wash equipment is simple to operate and maintain. We can ensure your equipment remains operational longer with decreased downtime. 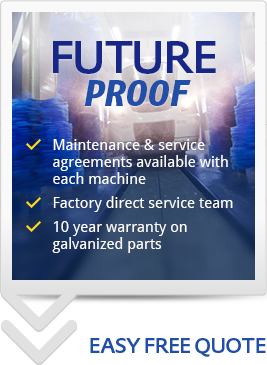 Westmatic offers customizable preventative maintenance contracts to ensure your equipment is routinely inspected and is operating at peak performance. This allows you to stay ahead of potential failures and will keep you washing! As an equipment manufacturer, we cannot help with site selection, building construction or business financing and we do not offer franchise opportunities. We've teamed up with a specialized financing company, Ascentium Capital, who stands ready to help finance your new retail truck wash equipment. Ascentium offers competitive payment options and their 100% Financing Program allows you to include tax, shipping, installation, and other costs. Ascentium Capital is a national direct lender that delivers affordable financing.